New MacBook Air: The best ever? Jobs is certainly dead-on when he suggests that the future of notebooks is in ever-slimmer, lighter laptops featuring flash storage. But is the new MacBook Air like nothing Apple has created before? Not really. The 13.3-inch model is basically an improved version of the previous MacBook Air ( ), albeit at a better price. The new 11.6-inch MacBook Air, on the other hand, is the smallest and lightest Apple laptop of all time, and its base price of $999 ties it with the plastic MacBook ( ) as the cheapest Mac laptop available. I’m not sure I’d call it unlike anything Apple’s created before—it’s got all the stylings of the MacBook Air and MacBook Pro lines, but is tiny like the legendary 12-inch PowerBook of old—but it might be the most novel new Mac released since the Intel Mac era began. One nice touch for users upgrading from a past MacBook Air model: if you’ve got a set of iPhone-compatible headphones with an inline microphone and remote, this generation of Airs will let you use that mic for audio input, and you can even use the button(s) for controlling music playback. Though many small laptops in the PC world feature shrunken-down keyboards that deviate from the standard keyboard layout in unpleasant ways, Apple has refused to compromise on this point—even on the 11-inch MacBook Air. Both models sport the same full-sized keyboard that Apple uses in all its other laptops, not to mention its USB and wireless external keyboards. The only real difference is on the top row of keys: they’re shorter than on the other keyboards, and the power button now appears as the rightmost key in that row. Typing on the keyboard feels exactly as it does on all those other keyboards, too; the thinness of the Air doesn’t mean there’s any less key travel. If you like typing on a MacBook keyboard (or Apple’s external keyboards), you’ll like typing on the MacBook Air. Keyboard and trackpad of the 11-inch (left) and 13-inch MacBook Air. One place where this new set of MacBooks regresses from the previous generation: keyboard backlighting is gone. I never considered keyboard backlighting an essential feature—I do know where all the keys are. Like heated seats in a car, it’s a feature that was occasionally useful and felt vaguely luxurious, and I’ll miss it. Also gone are the sleep light and the infrared port. Finally, one of the lamest features of the MacBook Air was its single mono speaker stuck under the right side of the keyboard. Good news, everyone: The new Air has stereo speakers nestled under the left and right sides of the keyboard. They’re never going to win any awards, but they sound vastly better than the old model. 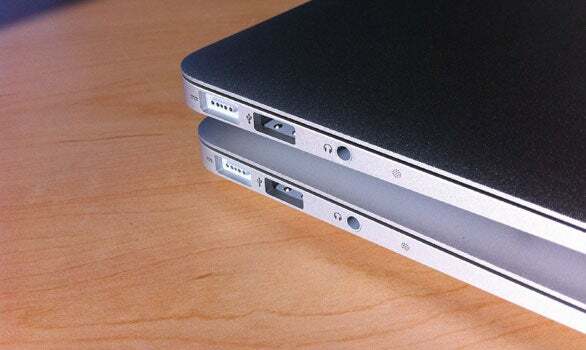 The original MacBook Air was the first Mac system to be sold with a flash-storage drive as an optional component, and in these new models all storage takes place on flash storage. In case you’re not familiar with the concept, flash storage is a hard-drive replacement that stores data on fixed memory chips (just like the iPhone, iPad and all iPods except the classic) instead of on spinning platters (like most of the computers out there today). There are also some disadvantages to flash storage. It’s more expensive than traditional hard drives, though prices are falling rapidly. There are also questions about ongoing performance of flash storage—depending on the type of flash storage you use, you could find that after several months of heavy use it’s dramatically slower than it was when you bought it. In any event, if you get a new MacBook Air you’ll be getting it with flash storage. Because of the expense of solid-state technology, the disk capacities for these systems are much lower than they’d be in a bigger system with a spinning hard drive. The $999 base-model 11-inch MacBook Air is the most extreme of these: it comes with 64GB of flash storage. (It’s a $200 upgrade to move up to 128GB.) The 13-inch models come in 128GB and 256GB flash-storage configurations. At 128GB and certainly at 256GB, you’ll find the MacBook Air’s storage space perfectly acceptable, especially if you’re only using these systems as a secondary computer. (If you’re planning on editing HD video on them, I suspect the lack of storage space will be no more of a problem than the slow clock speed of the Core 2 Duo processor.) The 64GB model, on the other hand, will be a tight fit. You can do it, but you’ll need to carefully pick which apps you want to install and make good use of file servers, or just embrace shuttling files on and off it via a syncing service such as Dropbox. Also, I’d suggest you keep your music collection on a server or just use the music in that iPod or iPhone in your pocket, rather than loading big media files on such a tiny drive. The new 13-inch MacBook Air isn’t a radical departure from the previous-generation Air, which was itself a surprisingly thin and light laptop compared to Apple’s other MacBook and MacBook Pro models. The new Air is almost imperceptibly thinner (0.05 inches thinner at its thinnest point, 0.08 inches thinner at its thickest), has exactly the same width and depth, and weighs just 40 grams (1.4 ounces) less. The keyboard’s the same, and while the glass trackpad is new, it takes up the same space as the old Air’s trackpad-and-button combo. Beyond the physical changes to the case, the extra USB port, and the upgraded video processor, perhaps the biggest hardware change to the 13-inch Air from the previous model is the screen itself: the old model was 1280 by 800 pixels, while the new one is 1440 by 900 pixels—all in the same physical space. The result is that everything looks a little bit smaller, but you’ve got more room for stuff on the screen. I found that after a few minutes using the new display, I was used to the change in resolution, though I did increase the default font size in a few of my apps just to take it easy on my eyes. This is not to say that $1599 is all you can spend on the 13-inch MacBook Air. Apple has provided several options for those who want to trick this system out: for $100 you can add a 2.13GHz Core 2 Duo processor (to the high-end configuration only), and either configuration can be upgraded from 2GB to 4GB of RAM for $100. (And you can only make these upgrades when you order the product; none of these features is upgradable after the fact, either by you or your local Apple Genius.) Even with those two additions, at $1799 you’d be getting a majorly upgraded system from the MacBook Air offered by Apple previously. In our Macworld Lab testing, we found that the 1.86GHz 13-inch MacBook Air was slightly faster overall than a current-model 13-inch 2.4GHz Core 2 Duo MacBook Pro. However, our Speedmark 6.5 score is based on a suite of tests, and the individual tests were all over the map. The Air, powered by its flash storage, excelled on our storage-based tests. Powered by the nVidia GeForce 320M graphics processor, it held its own on graphics-related tests, but our calculation-intensive tests showed the effects of its processor’s slower clock speed. 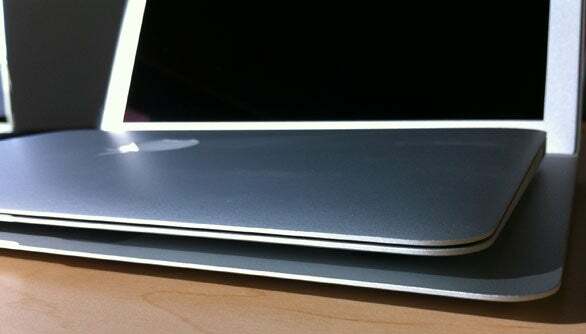 The 13-inch Air also easily outdistanced previous models of MacBook Air, aided by its fast storage and upgraded graphics. Not only is this new MacBook Air the fastest Air ever made, it’s roughly comparable in speed to the other two current 13-inch Mac laptop models. That’s a first for the MacBook Air product line. I love small Mac laptops. The smaller, the better. That’s why I embraced the 12-inch PowerBook in its heyday. But the 11-inch MacBook Air puts even that legendarily small Mac to shame: it trades an inch of depth for an inch of width, weighs in at half the PowerBook’s weight, and is a full half-inch thinner than the old paragon of tiny Apple laptops. Yes, there’s a new champion of Mac laptop smallness, and it’s the 11-inch MacBook Air.